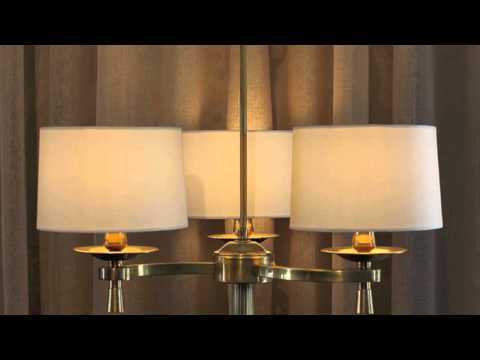 Stunning pair of Art Deco bronze floor lamps from the prestigious Prince de Galles hotel in Paris. France, Circa 1940. We purchased all of the lighting available from this historic hotel in the 1980's when they were remodeling. A pair of these floor lamps were found in each room when the hotel was in operation. These lamps, as well as the sconces, desk lamps and table lamps have remained in storage for the last 25 years and have not been for sale. Fortunately, we had first priority in buying the complete collection of lighting from the Prince de Galles. The lamp bodies are all in their original condition and each have varying degrees of natural patina, they have only been cleaned. Three socket arms gracefully surround the crown. The lampshades were replaced and are lined in silk inside and outside, which adds even more sophistication to the finished look. The shades can be custom made with either round or square shades. Measurements: Measurements: H.75" x W.21" x D.21"
Diameter of lamp stem: 1 1/4 "